Wonders Child Care is an accredited, non-profit early childhood education provider with nine locations throughout DC, Maryland, and Virginia. Through its 35 years, it has earned a reputation for delivering high-quality, affordable care in a flexible way to families of the Washington DC metro area. Wonders offers programs for infants through school age including full-time, before/after, and summer programs. 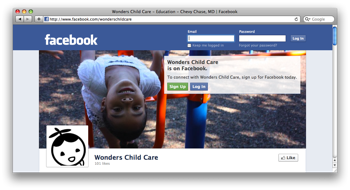 They have an exemplory Facebook presence to accompany their diverse programs featuring photos, announcements, and links to articles on child development. What input or reactions did you get from families when you were planning to create a Facebook page? There was a mix of responses. Most of the respondents said they were excited and would be interested in seeing Wonders on Facebook. A few expressed little interest in learning more about Wonders via Facebook and a very small minority felt Facebook was not appropriate due to concerns about using photos of children. Was there anything surprising you learned from your survey? About 95% of the respondents thought the page should be private, restricted or hidden. What is the primary benefit you see for the page on Facebook? I think the Facebook page helps to further communicate the Wonders philosophy and mission both to our current families and families who are thinking about enrolling in one of our programs. We have nine different centers that each have their own unique qualities. By using the page to share information about activities at the various sites, it helps connect all of our families and programs. Mine Newsletters– Use gems from the content you are already creating for newsletters and other family updates. Keep it brief and post links to relevant child development articles online. Connect with Staff (Past and Present)– Staying in touch with staff will benefit you on many levels. Some might even “like” you. Get Consent for Photos– The last thing you want is to share something that a parent considers private. Let parents opt-out of sharing photos of their children. We recently learned from a parent survey that close to 20% of our current families found us through a web search. I think social media is a valuable aspect of a web presence. Some former employees are also connected to Wonders through the Facebook page. I really like this aspect because we like staying connected to former staff after they move away. Your page has photos, articles, and news about Wonders, how much work does it take to create all of that content? We have two staff members who contribute to the page. I have been doing it primarily. I recently hired an assistant who has been also adding content. Each program director writes a weekly e-newsletter to his or her families at their site. We get ideas and content from these communication tools, too. All directors are asked to send photos to for our photo “bank”. It doesn’t take much effort once you are set up. What is your secret to getting so many “Likes” and “Friends”? We used the center-based e-newsletters to promote the Facebook page. I also sent encouraging notes to my Facebook friends who have some connection to Wonders. We did offer a Wonders t-shirt to the 100th person who “liked” our page. The winner was a mom at one of our school age programs. When we contacted her to let her know she had won, she was excited! Do you have any specific policies regarding privacy for Facebook posts? All parents sign a photo permission form at the start of the year. They can opt out of having their children’s photos used in any promotional way. Parents who have not granted permission to use photos will often give us permission for a particular photo if we let them know how we want to use it. How do you get such great photos? Primarily our teachers and program directors take most of the photos. Do you know how many new families or connections you have made because of your Facebook presence? We haven’t tracked this. I do know from conversation with some folks that they pay attention to what we are posting there.